Available in the Netherlands as of September 21st, 2015 on www.wolflegalpublishers.com and www.bol.com. The book will be launched on the international market and as an e-book shortly – please stay tuned. Thousands of Panamanians of the indigenous Ngäbe-Buglé peoples travel every year to Costa Rica to harvest coffee, mostly temporarily. They come from difficult circumstances: over ninety per cent of this group in Panama lives in extreme poverty. A majority of the migratory children (of all ages) work on the coffee fields. This book sheds light on the world of indigenous Ngäbe- Buglé children, migrating and working from Panama on the Costa Rican coffee fields. It demonstrates and describes their experiences. All children agree that Costa Rica is beautiful, preti, as they say. Simultaneously they speak of violence, fears and deprivations. These children are both vulnerable and resilient. Their ideas do not always coincide with adult professionals or international human rights law. 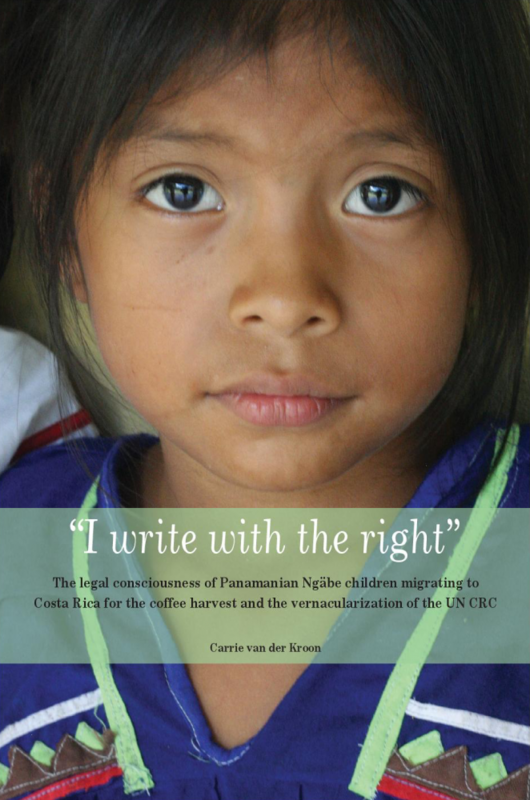 “I write with the right” illustrates children’s consciousness of internationally codified rights and the reality on the ground. It furthermore demonstrates what actors and factors influence their realities and its implications for international human rights law, policies and legal theory.